Al Wakrah stadium ... work begins. Construction work on six of at least eight venues that will be in used for the 2022 Fifa World Cup in Qatar is currently in progress, said a report. Battered by criticism, facing investigation over graft issues and the financial fallout from an energy price slump, Qatar is forging ahead with multi-billion-dollar work on the stadiums for the event, reported the AFP. World Cup organisers said the preparatory work has also started on a 80,000-seater stadium in Lusail, a new $45-billion city being built 15 km north of Doha, where the final will be held. 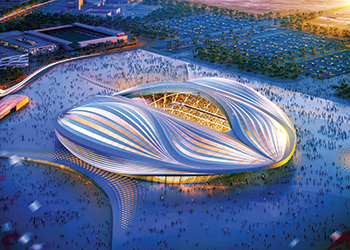 Qatar will even complete work on the first ground, the 40,000-seater Khalifa International Stadium – the venue for the 2019 World Athletics Championships – by the end of this year, six years before the first game will be played, they stated. Elsewhere, work has begun on the Al Rayyan stadium, the Qatar Foundation Stadium and the Al Wakrah stadium. All are 40,000-seat venues, which will host matches up to the quarterfinals, said the report citing the committee officials. Also under way is work at the 60,000-capacity Al Bayt Stadium, which will host one of the World Cup semifinals, it stated. All the World Cup-related infrastructure work can be monitored and overseen on CCTV by some of the more than 400 members of Qatar’s World Cup organising team from an all-white space-age control room in their skyscraper Al Bidda Tower headquarters on the Doha waterfront. “Great progress has been made so far in preparations,” Nasser Al Khater, assistant general secretary of Qatar’s organising committee, said last month. “Since winning the bid in 2010, incredible amounts of work have gone in,” he added. Meanwhile, Arab Engineering Bureau (AEB) has been appointed as the design consultant by the Supreme Committee for Delivery & Legacy (SC) for the eighth proposed venue for the World Cup, which will be located in Al Thumama area of the country, said a Gulf Times report. The 40,000-seat stadium will host matches leading up to the quarter-finals stage of the competition. In legacy mode, the stadium capacity will be reduced to a maximum of 20,000 seats. The stadium will be located on an area of 515,400 sq m that already comprises four outdoor training pitches and office facilities currently used by the Qatar Football Association Technical Committee, it stated, citing a senior official of the SC.